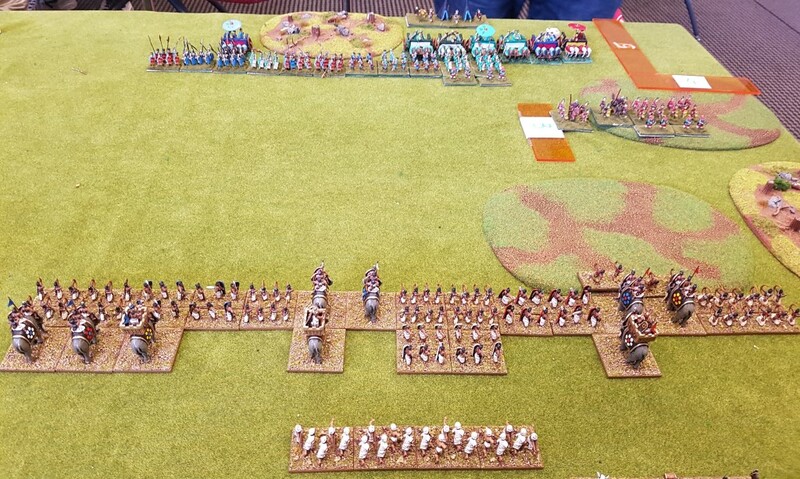 Big Battle DBA between Successor armies, with Nick and Dave visiting a few weeks ago. 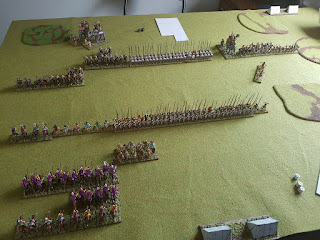 Only just got around to posting some pics. First game between Nick and Dave, which came down to a cavalry battle with the Phalanx sitting back and watching... Dave in the back, Nick in front. 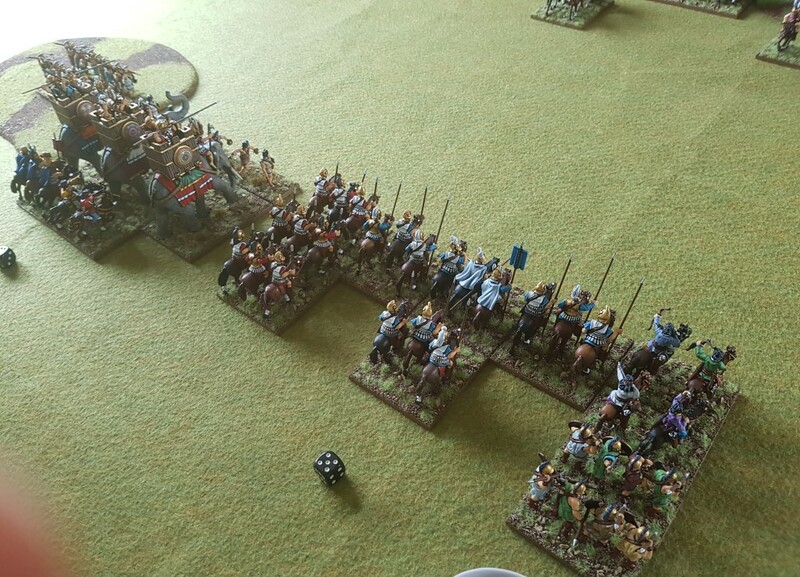 Elephants get into Dave's cavalry which in't so great for the cavalry. 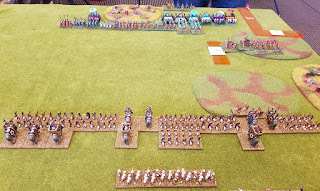 Dave's general is fighting head to head with an elephant with an enemy to each flank. 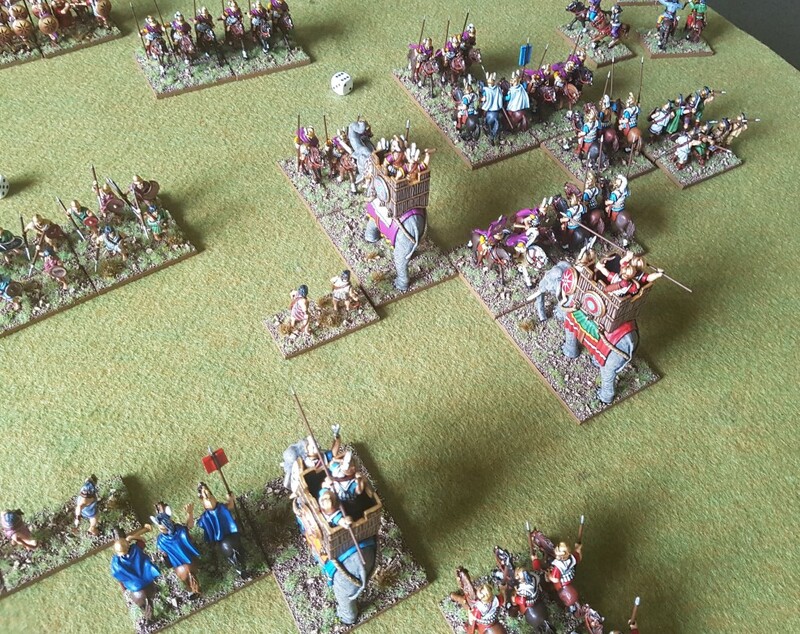 Possibly the worst possible position for him... with his death and further elephant induced casualties against the cavalry the game is lost. Game 2 I take the force Dave used against Nick. I weight the left wing heavily, leaving almost nothing on the right... 'refused flank' is the plan. 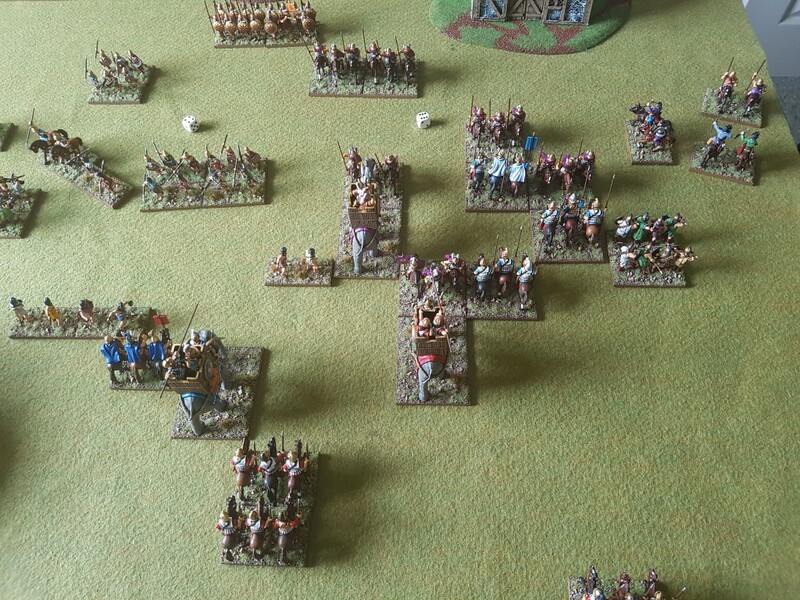 The Phalanxes of each side advance on each other, and Nick moves his elephants to counter my left wing. 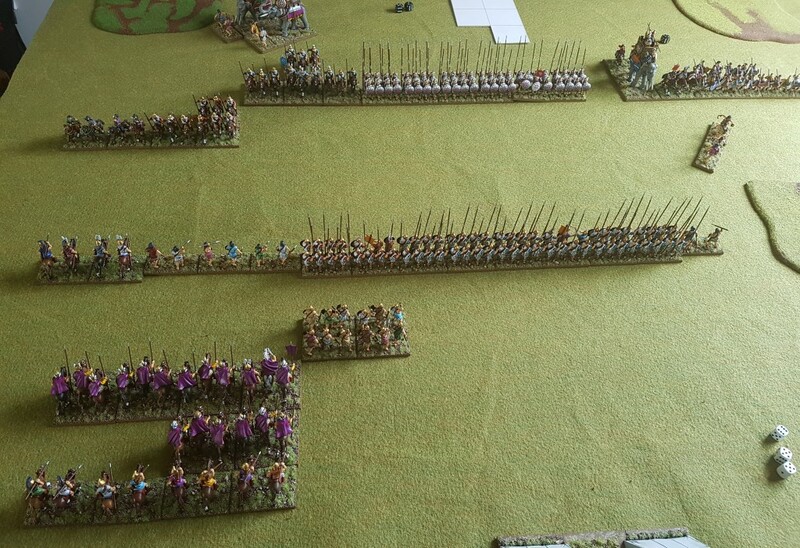 Phalanxes hit, as do the cavalry on my left. 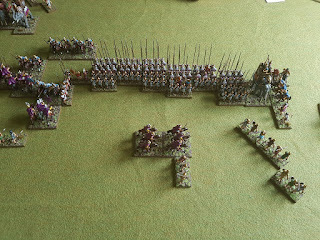 Nicks phalanx starts to prevail over mine due to some lucky combats, and he wacks into my exposed right flank too. 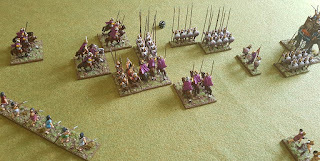 I start moving over some Peltasts and Lancers to try and offer some help. 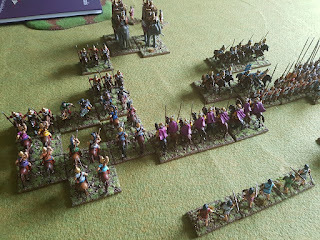 On the left my superior numbers of cavalry are winning the day, and Nick's elephants haven't arrived yet. 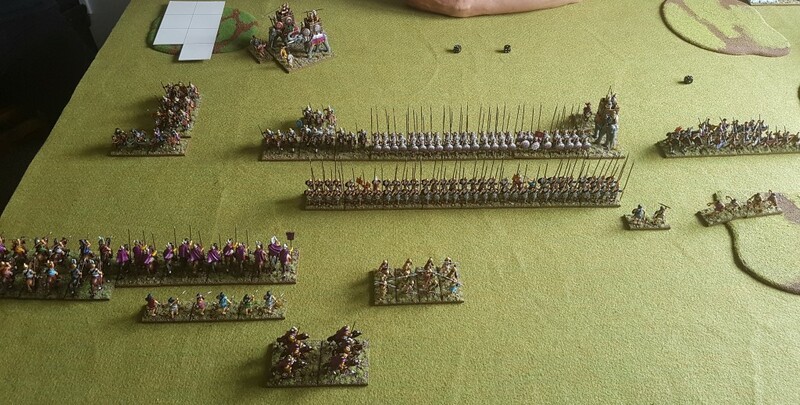 Combat on the left where I have my light horse in two ranks. My Phalanx is losing in the centre and right, and winning on the left. Elephants hit my cavalry, but on a 6-1 result one of my knights manages to kill an elephant! 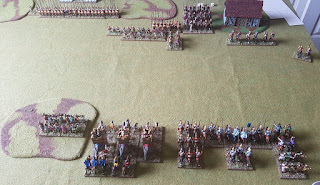 My centre/right collapses and routs, as does Nick's right flank. It becomes a battle to see who can exploit the breakthrough first. Both armies just an element or two off breaking. It was the Warclouds Convention in Christchurch this Waitangi weekend. 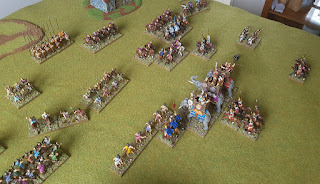 Eight of us got together to have the first practice tournament of ADLG before the Nationals at Easter. 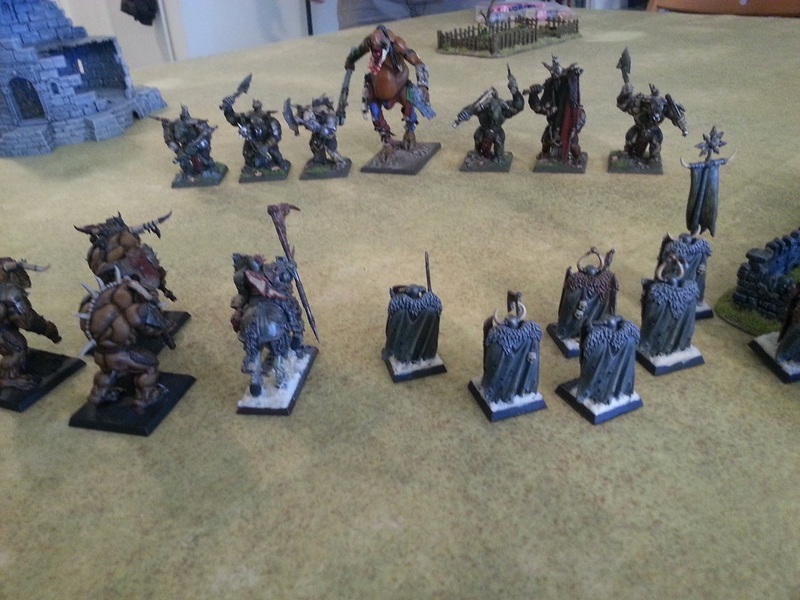 200 points, 2 hour games. ADLG (L'Art de la Guerre) is the popular new French Ancient's Wargaming rule set. When I say 'new', I mean it is new to us here in New Zealand. The rules have been around for a while in France, and are actually up to the third edition so are well playtested by now with good English and Spanish translations available. They seem to be the new go to rules for Ancients in Europe, America and Australia, with tournaments booming again. Having played about 10 games now I can see why. ADLG has enough detail to keep you interested, but simple mechanics that don't strain your brain and are new player friendly. 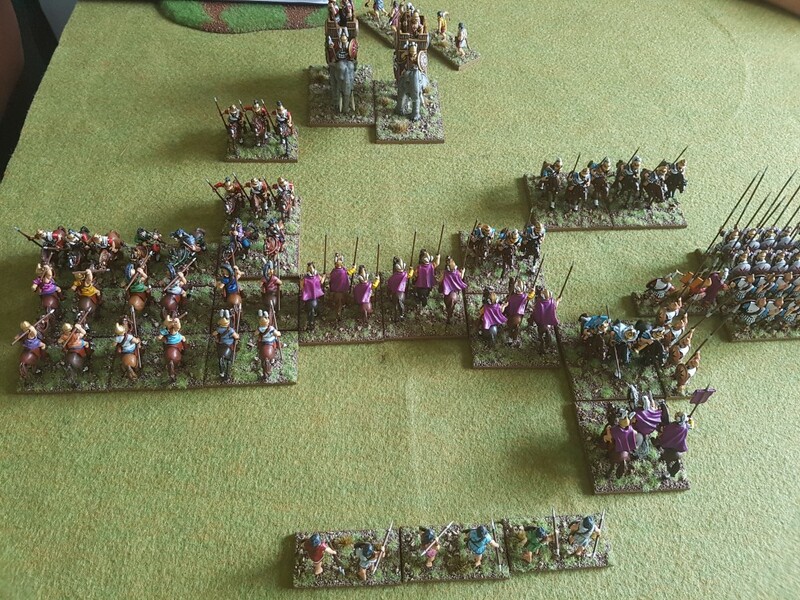 Number of figures and playing area are less than you need for other rule sets which helps for entry level. Plus the nicely presented full colour rulebook comes with all the army lists too so you will only ever need the one book. Tim Porter has this excellent resource page with lots of links about it. I must admit that reading the rules I thought the combat system seemed too simplistic at first. Both sides just roll a D6 and add a factor from 0-3 depending on opponent, with a few modifiers, to see who damages the enemy. At first glance this seemed like bit of a crap shoot, but in reality the odds do generate quite a reasonable set of results and you start thinking about sensible tactics pretty quickly. You can certainly dice your way in and out of disaster, but this is not a bad thing I think, and is kinder for new players, and likely more historical too I would say. I've played a first few games using cavalry armies to learn the rules, but decided to pull out my Chola Indians for this tournament. I've used this army for about 15+ years across multiple rule sets so I was looking forward to seeing how they did. 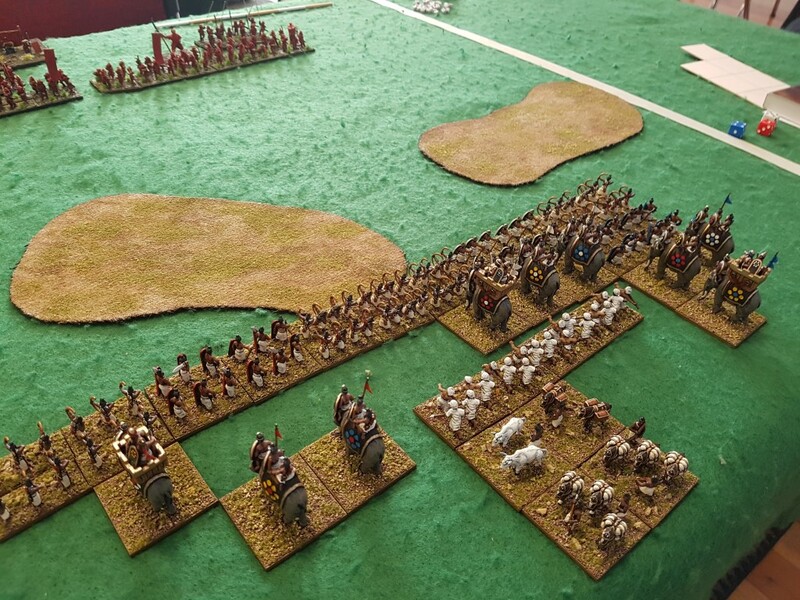 The Chola army is all elephants, swordsmen, and bowmen (and a few levy cheering on from the back, but they don't really count! 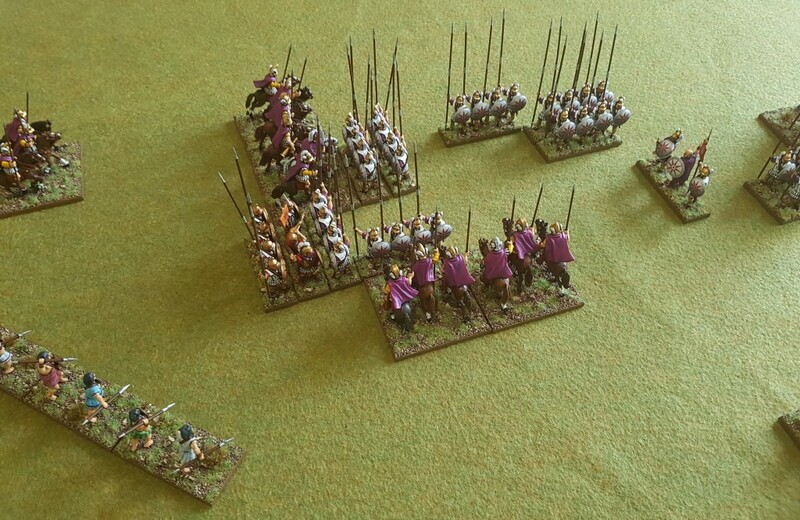 ), so very different to a cavalry army. 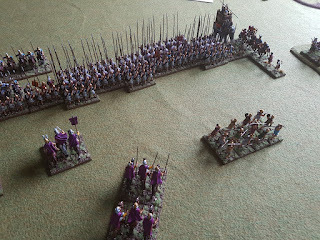 First up I faced Josh's Samurai army, which was mostly medium swordsmen with bow, quite a few of them also being elite. I immediately regretted the fact I hadn't brought enough light infantry to screen all my elephants from shooting (something I should have known as it has been important to do that in all other rule sets too for heaven's sake!). 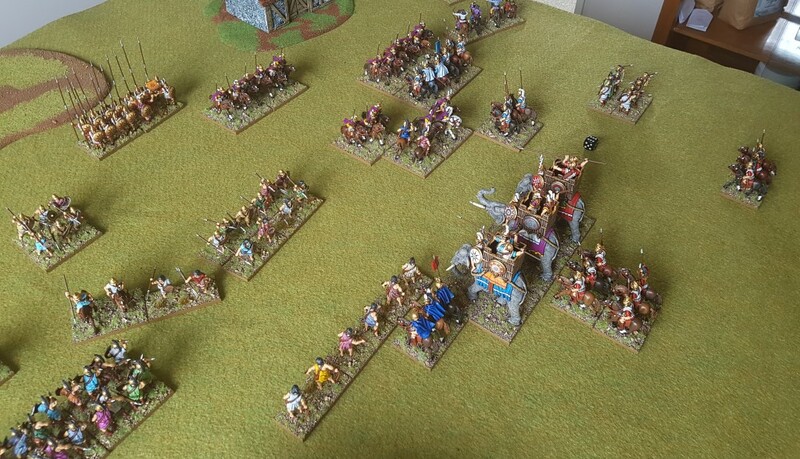 So I decided to put my elephants in a second line, ready to fill the expected holes in my first line and hopefully win a war of attrition. The game was rapidly over, my 25 strong army breaking, and I think I got about 10 of the 22 of the Samurai break point in return. LOSS. (Incidentally the 28mm figures in the Samurai army were being used to represent the 3 generals). 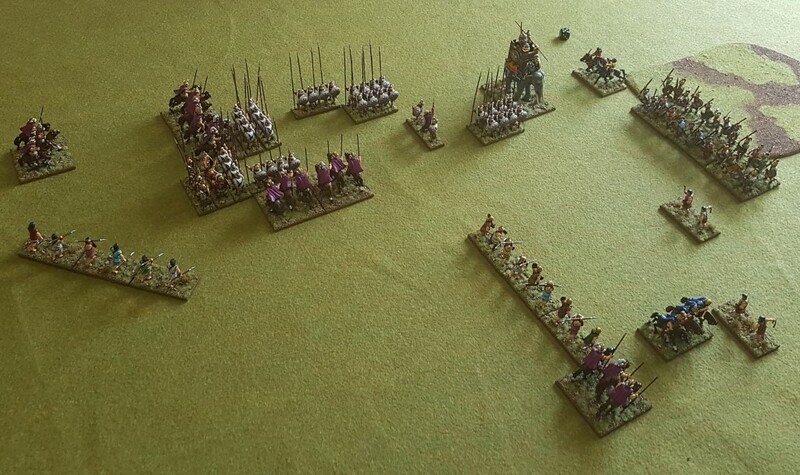 Next was Kerry using a Pyrrhic army. 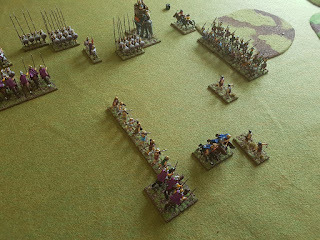 The Pyrrhic heavy foot took some fire on the way in, but quickly ground down my medium foot and resisted my elephants. I think I did about 8-9/24 break points to them in return. 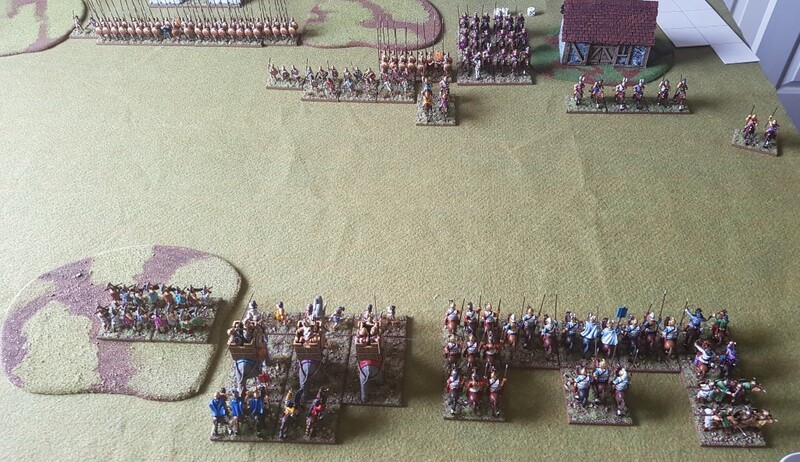 Not unexpected given the tactical situation, and was a dumb idea to go head to head with heavier troops like this. LOSS. Forgot to take a picture of this one! But against Brent's Chinese cavalry army my Elephants and bowmen prevailed. 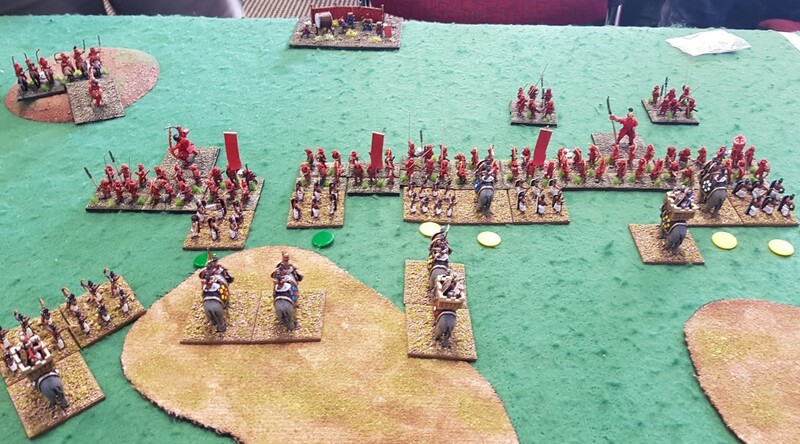 An outflanking maneuver by the Chinese cavalry caved in my left flank briefly, but stopped when it reached the elephants and more bowmen. I think he got got about 10/25 of my elements. WIN. A hard fought game against Andre, and the first one where I decided to throw my generals into the charge with the elephants. 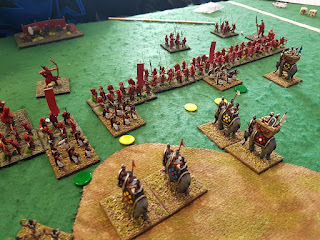 The extra +1 and furious charge and ignoring of armour by elephants saw them smashing things up very nicely in this game. I lost about 16/25 of my breakpoint I think. WIN. Didn't even have time to breath! 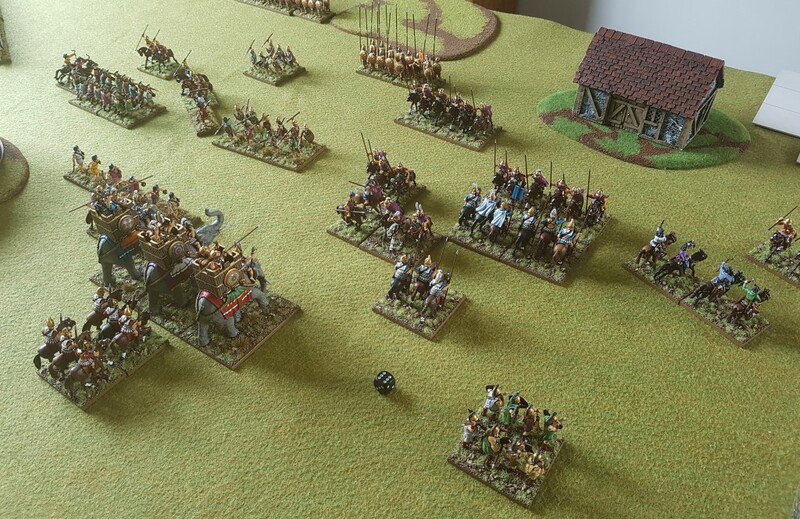 One turn to move to charge range, two rounds of combat and the game was over. 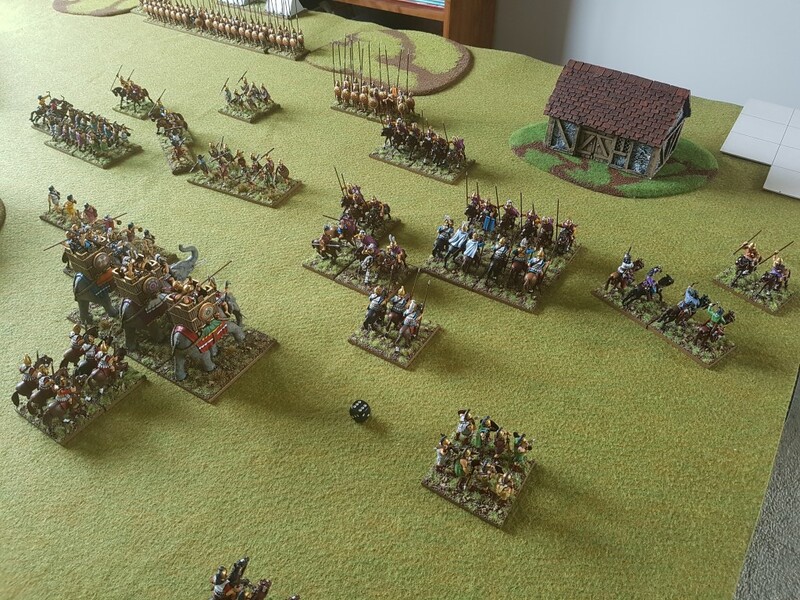 Ian's Norman heavy cavalry evaporated as they charged head on into my elephants and bowmen, including charging uphill at my line in the centre of the table. I lost 5/25 of my breakpoint. WIN. 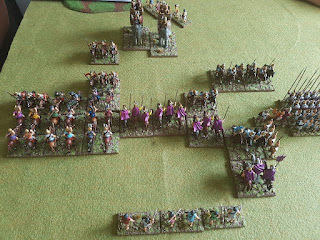 A good weekend of ancients wargaming was had by all. I'm pretty sure ADLG will become the new go to rules for ancients here too, and draw in new players as well as the oldies. It's simple, quick and fun, and the lower entry level in terms of needed figure will help. Despite being rusty on the rules on the first day, I had 3 games easily finished by 2pm after a 9am start, and time for lunch etc. 2 hours should be plenty of time for these games. 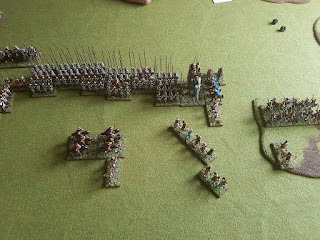 I look forward to some bigger games too, and in 28mm also. 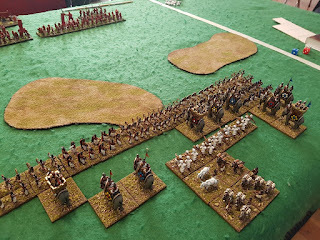 Secondly, I must get some better scenery, and maybe casualty markers! I bought a few better quality pieces from Clinton who was along with his goodies today, and told him the right sizes so he can make some stock for the Nationals. Looking forward to it.